Order your Mojotone Pre-Wired Les Paul Long Shaft Wiring Kit from AMS and enjoy 0% Interest Payment Plans, Free Shipping, Free Extended Warranty & 45 Day Money Back Guarantee. An easy upgrade that will inject new life into any Les Paul! At one point or another, it is essential for any guitarist to upgrade or replace the electronics in their guitar. Each component is just as important as the next, which is why Mojotone has created a pre-wired assembly with the highest quality components on the market. Bring your guitar to life with our smooth custom taper CTS potentiometers and creamy sounding paper and oil Vitamin T capacitors for a vast improvement over your stock electronics! This is a standard Gibson Les Paul style kit that utilizes 50’s style wiring for maximum tone! 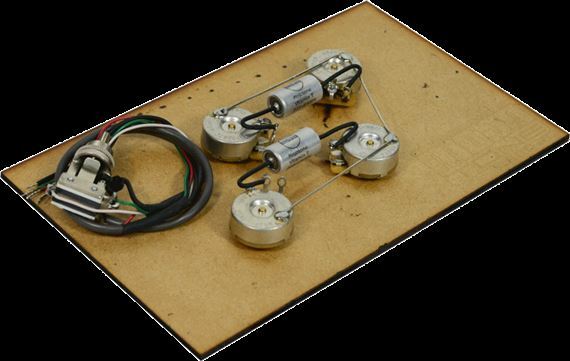 Designed specifically with long shaft potentiometers, it will fit most Les Paul style copies and originals with thicker carved tops. Use 24-knurl push on knobs only and may require enlarging holes to fit Asian made guitars with metric pots. Just installed this harness on my '79 Les Paul loaded with Seymour Duncan Antiquity humbuckers and the results are amazing. If you are looking for that 50's clear tone this will help you to get closer to that tone, (assuming that you already spent some money in some nice vintage pickups) I had a few questions about the wiring diagram, but the guys at mojotone answered back right away.